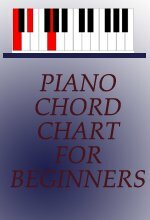 The diminished chord is considered to be one of the most unstable chords in music. This means that when it is played it creates tension that demands an onward movement to a stable chord such as a major or minor triad. Even though a diminished triad or chord may sound unusual, it plays a very important role in music and is used more frequently as a passing chord or tone. Diminished triads or chords are used more often in Jazz and Gospel music. So I would suggest that you start listening to some jazz or gospel music and incorporate them in your practice sessions. A diminished triad is easy to form and it is also easy to play on the piano. When forming a diminished triad, all you have to do is to flatten the 2nd and 3rd note of a major chord. For example – the F major chord is played as F, A, C. When the A and C notes are flattened leaving F in its original position, what is been created is the F diminished triad. You should notice that C flat is the same as B since a flat lowers the pitch of a note by one semitone. Click here for more information on tones and semitones. 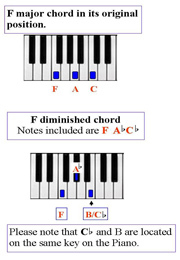 The way in which the F diminished triad is formed above can be applied to all major chords. 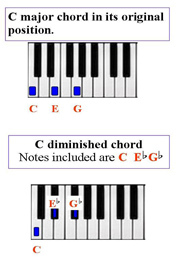 Here is an illustration showing how the same concept can be applied the C major chord. 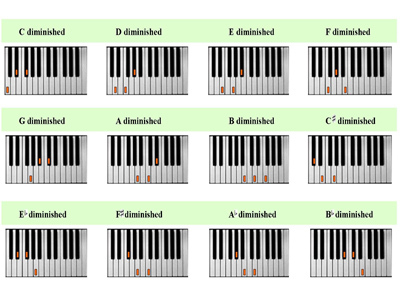 Below is a table with all the diminished triads that can be played on the piano. Take your time and learn to play them on your keyboard. 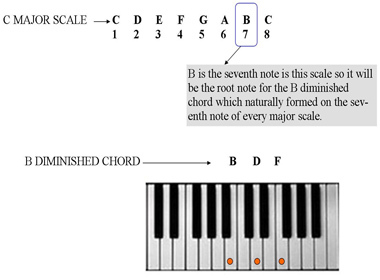 A diminished chord can be naturally formed on the seventh note of a major scale. For example – The letters of the C major scale are C D E F G A B C. B is the seventh note in this scale so it will be the root note for the B diminished chord. Remember, this chord will only have three notes since we are dealing with triads. Take a look at the illustration below for more information. The illustration shown above applies to all major scales. Click here to learn more about the structure of major scales. Click here to leave the diminished chord page and return to home page!